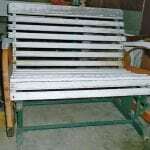 I have this old children’s glider and would like some information about it and its current value. 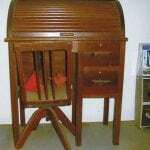 I can’t find anything online about it and hope you can help. I have a picture of us sitting on it many years ago. 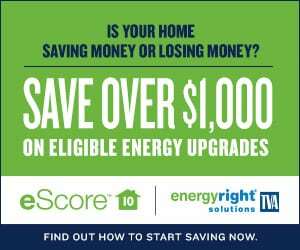 My sister is 78, and I’m 70. Your glider was made by The Goshen Manufacturing Company in Goshen, Indiana, and patented as the ROK-O-GLIDER. In the same form and colors, the company made glider chairs and large platform gliders with facing seats to hold four children. 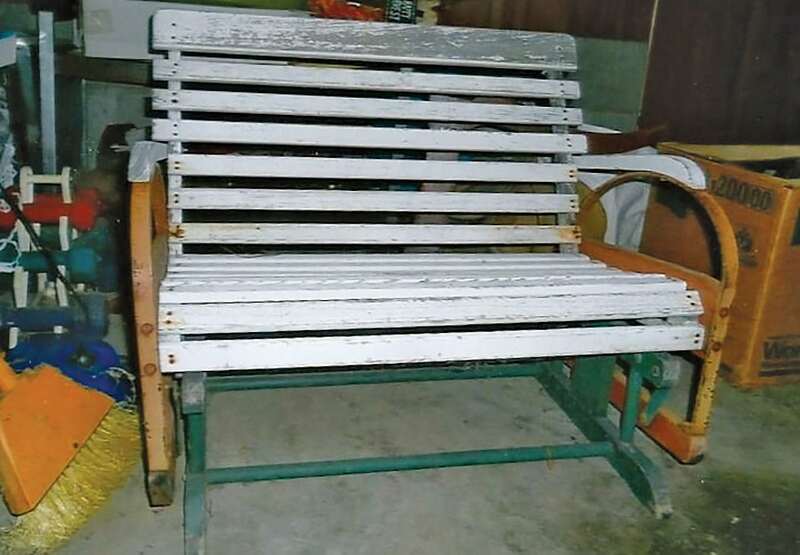 A two-sister glider just like yours with the original red, green and white paint sold at auction in 2013 for $190. ROK-O-GLIDER furniture owned by people with polite girl children has survived. You should take a picture of you and sister holding the picture of you seated in the glider. I was hoping you could tell me the value of these two chairs. I only have one of each. I believe the one on the left is a Duncan Phyfe. 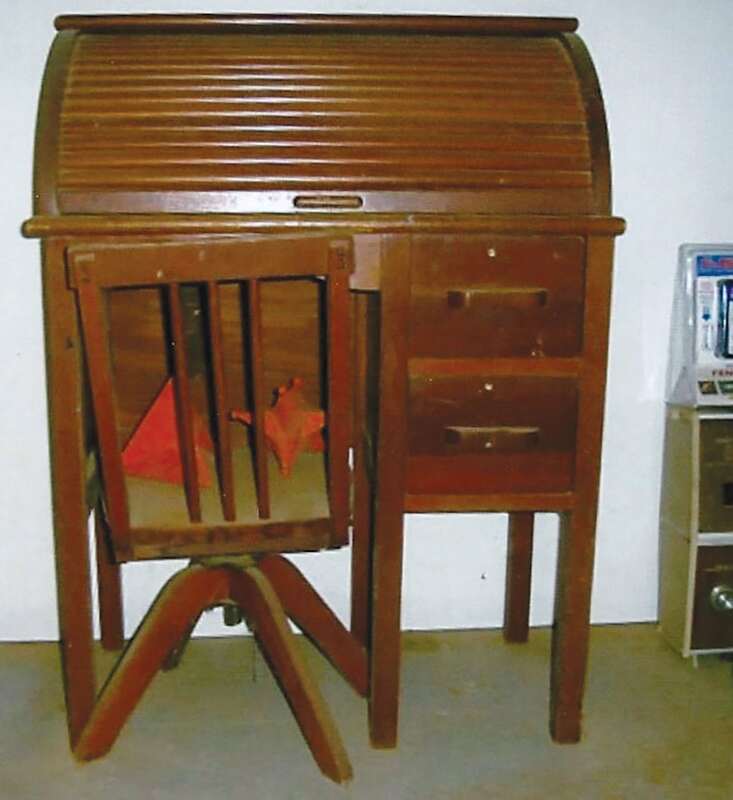 The child’s roll-top desk was given to me in a used condition around 1967. The outside is in great shape, and the inside has some model paint. 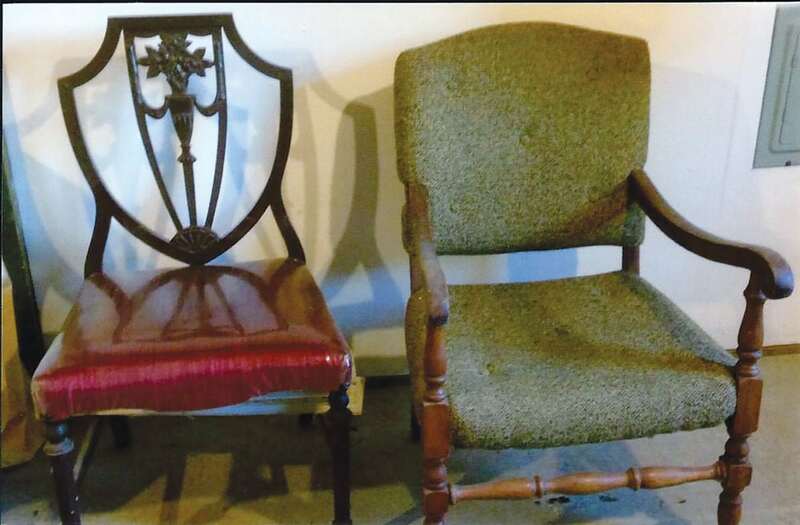 You are correct: The chair with a shield-shaped back, the one on the left, was made in the Duncan Phyfe style in the mid-20th century. It has a vase of flowers on the back and round tapered legs. The chair with a padded seat and back is a bit simpler with shaped wood arms and turned legs. 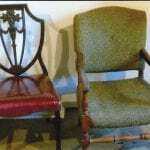 Both chairs were made around 1945 and would sell for $50 or less. 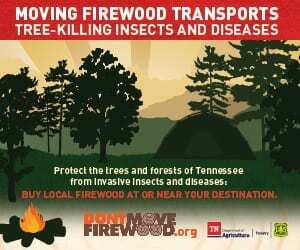 All wood, well made single chairs appeal to buyers, though, because of their current price. 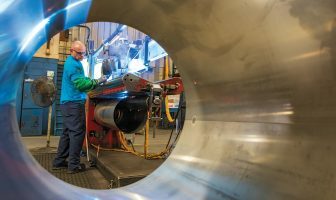 A new generation of nest-builders sees them as a project in simple upholstery or experimenting with a new paint or finish. Child-sized roll-top desks can sell from as little as $50 at a tag sale to just more than $250 with a matching chair in a nice antique shop or mall. The little swivel chair is a plus and worth $45 even without the desk. Solid oak and labeled sets sell highest. They were popular in the early to mid-1900s. I can’t find a date on the horse. The mark on the bookends looks like “1926 Z.W. Smith.” I would like to know the value. 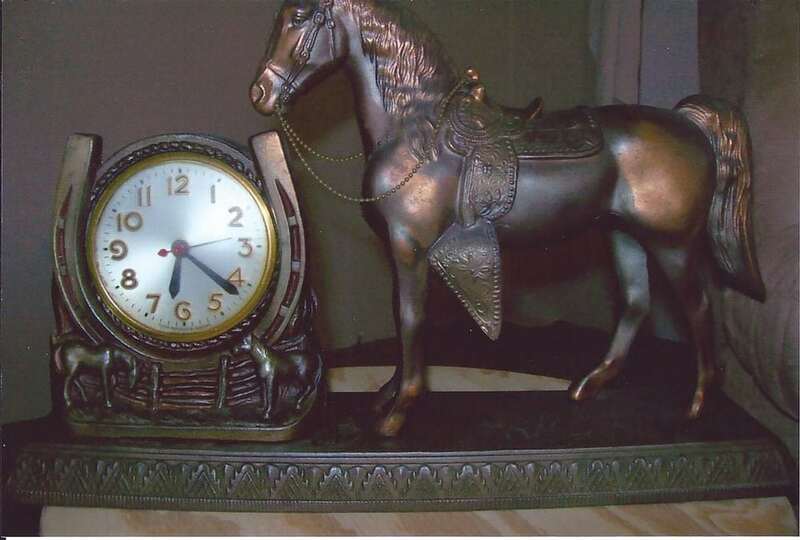 A horse-and-horseshoe mantel clock in working order might sell for $100. 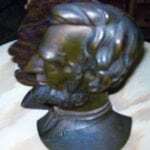 If the bronze-wash finish is scuffed or worn to reveal the gray metal underneath, the value is diminished by half. If it doesn’t keep time, the value is reduced by half again. Cowboys and rider-less horses were popular in Saturday matinee days. As many baby boomers sell, distribute and donate the mounds of books we’ve kept since college, our heirs typically choose a few to keep — for always. 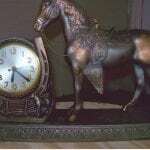 They have revived the early 1900s custom of figural and artistic formed bookends. 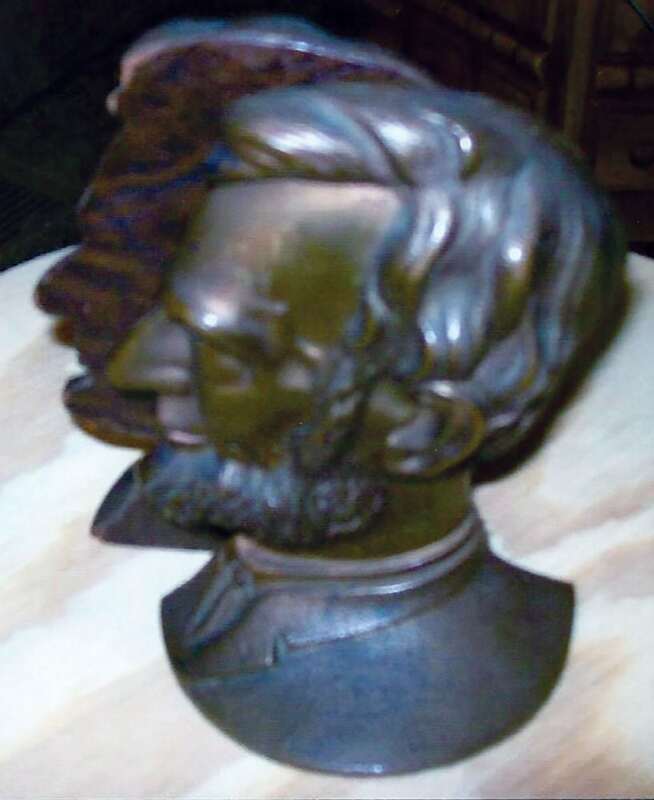 Bronze-washed profiles of Abraham Lincoln like yours are selling online for $18 to $55 a pair.